In a small skillet, toast the cumin seeds and cloves until fragrant, two minutes. Transfer to a mortar and pestle and crush into a powder. In a small bowl, combine all the spices, including the salt. Arrange the florets on a rimmed baking sheet. Toss with the oil and then sprinkle with the spice mix. Roast for 15 minutes. Transfer florets to a cast iron skillet. Pour the cream over the dish, stick back in the oven and roast another 15 minutes, or until tender. Garnish with fresh cilantro and serve immediately! Calling all cauliflower scaredy cats! Today brings new meaning to your life. Cutting-edge purpose. A crisp state of mind. A fresh point of view. A hot off the press approach to existing to the fullest. And yes, I'm still talking about cauliflower. We're gettin' coo coo for cauli. And by that I mean we're going to roast it with a blend of tantalizing curry spices, douse it with cream and roast it some dang more. This is one of those recipes that takes no time at all to prepare, but tastes like it was delivered on a rare imported gold-lined orchid leaf straight from the tusk nectar of an elephant. I WISH I knew what that even meant. Let's just make this. 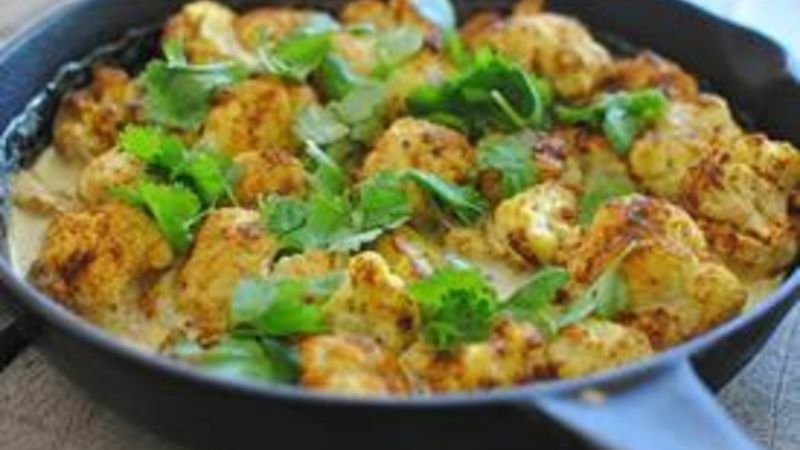 Grab a head of cauliflower, some cumin seeds, a couple of cloves, Indian curry powder, some cinnamon, cream and cilantro. Yes. Start by giving those seeds and cloves a good toast. This will only take a couple of minutes. And the smell? Heaven haaaaalp us. Now get it all mashed up into a fine powder using a mortar and pestle. You could also use a coffee grinder, or a small food processor. Sprinkle those florets gooood with all that spice. There's a nice drizzle of olive oil in there too. Roast 'em for a smidge! Once they're roasted, you'll just transfer them to a cast iron skillet, lawk so. Then pour the cream over it all, omg. Holy cauli. Oh that almost rhymed! And then this is what it looks like after it's been roasted again for a little bit! You'll just top it with fresh cilantro and take it straight to the table like this. If you make it that far. I thought you might need to see how it looks from overhead. If you stand just like the smell will drop you to your knees (wear kneepads). Oh dear. Okay what I did was sear up a nice flank steak to go along side this creamy curried mess of glory. And life was beautiful. Just do this, for the love of Pete. Bev asks, "Who is Pete again?" For more musings, visit her blog Bev Cooks and her Tablespoon profile.